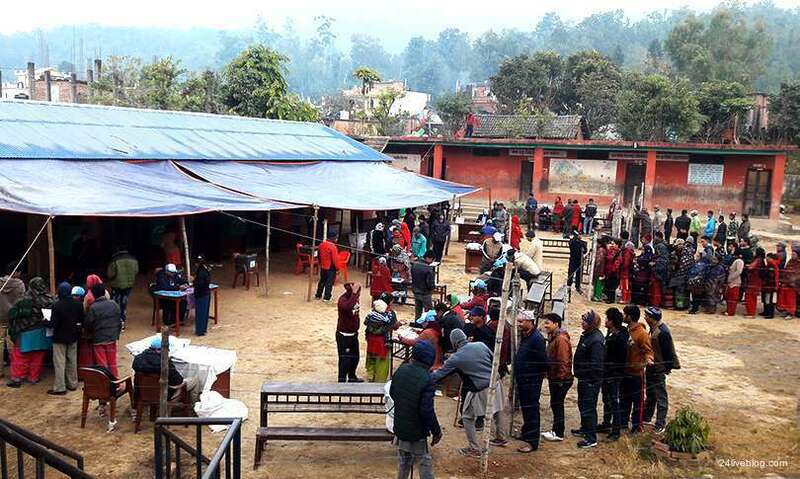 Voters of 45 districts in Nepal exercised their franchise on Thursday in the second phase of provincial and federal parliamentary elections on Thursday. The voting that began on 7 am will continue till 5 pm, says the Election Commission. Voters of 128 federal and 256 provincial constituencies will cast their ballots to elect their representatives today. Other 32 districts of mountainous and high hilly regions held voting on November 26. The polls will elect a 275-member House of Representatives, the Lower House of bicameral Parliament. Of 275 members, 165 will be elected through the first-past-the-post system from 165 constituencies of 77 districts. Voters simultaneously cast their ballots to elect other 110 members in the proportional representation category. The entire country will be considered a single constituency for the PR system and the Election Commission divides 110 seats among the contesting parties on the basis of votes they would poll. Each party has to meet criteria of various cluster groups including women, Aadibasi Janajatis, Madheshis, Tharus, Muslims and Dalits while picking the winners. Meanwhile, elections to seven provincial assemblies will also be held simultaneously. It will be Nepal’s first exercise of operating provincial level legislative. Each provincial assembly has varied strengths and constituencies on the basis of population. In total, there will be 550 members, exactly two-time the strength of House of Representatives. As in the House, 40 per cent of total (220) will be elected through the PR system. Each House of Representatives constituency has two provincial constituencies for first-past-the-post polls and total 330 provincial legislators will be elected in seven provinces in total.